A complete range of single and tandem Paragliders. From students, beginners, advance and confirmed pilot; up to competition. PARAGLIDERS There is 1 product. A wide choice of improved gliders. 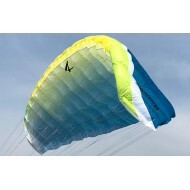 A COMPLETE RANGE OF IMPROVED TANDEM PARAGLIDER !